Perfect for rooms with limited work space, this mission style single pedestal computer desk is sure to provide just the right amount of storage and desk top work area for your specific needs. Complet the ordering process by selecting a wood type that compliments the rest of the room as well as a finish color to match any existing furniture. Our selection of hardware options also allows you to add an attractive accent to your new solid wood computer desk. 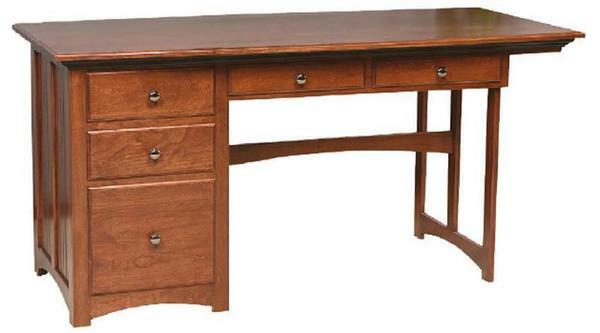 Give one of our knowledgeable Amish furniture consultants a call today at 866-272-6773 for additional information on this beautifully crafted Single Pedestal Computer Desk.